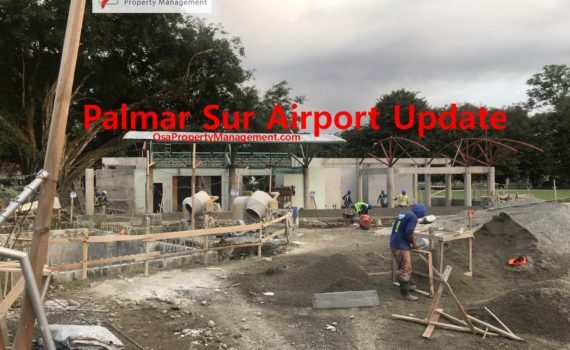 Recently we made several visits over the course of a week to Palmar Sur in order to provide a Palmar Sur airport update. The remodeling project began in August 2018 and involves many wonderful upgrades and updates from the previous airport terminal. The goal for the construction crew, based on several interviews with the Project Manager of the project, is to have the construction phase of the airport completed by December 30, 2018. Watch the video below or watch it on YouTube here. Half the runway and the area near the terminal needs to be paved with more asphalt. With everything that needs to be completed before opening, along with the Christmas/Holiday season just a couple of weeks away, we don't expect it to be ready anytime before February 1, 2019...at best. In the short-run, this is definitely an inconvenience, and it is a bit frustrating that they didn't start the construction in May 2018, instead of August. Had they started the work in May, that would have left sufficient time to complete the remodel in time for the high season which is now starting (December 2018). In the long-run, this is a wonderful upgrade and we will all soon forget the temporary inconvenience this closure has caused. Let us know your thoughts about the Palmar Sur Airport Update. Also, if you are planning a trip to the Osa/Southern Pacific region of Costa Rica in 2019, or later, be sure to submit a form below to let us know and to let us help you with your trip planning. Additionally, if you are a home or lot owner in the region, contact us for a no-obligation bid on our property management services.